Want to see? Click here for webcams on Highway 20. Click here for up to date road conditions at DriveBC. Our new ferry is set to run from Port Hardy to Bella Coola this Fall! Click here to check the schedule for September 2018. This is a sport fishing paradise for anglers! 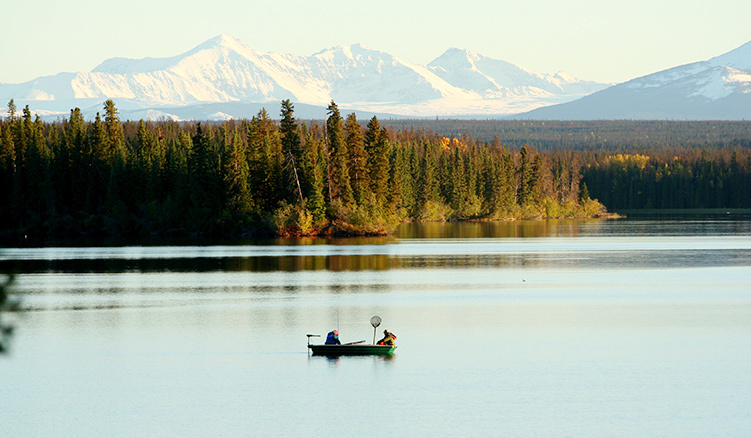 The West Chilcotin is home to some of the best sport fishing in the world! If yo u're looking for a British Columbia fishing vacation, this is the place to be! Local lakes teem with our wild Native Rainbow Trout, known for the ferocious fight they'll give any angler trying to land them. Nearby lakes and streams also offer Cutthroat and Dolly Varden or if you'd like a change of pace, go Steelhead and Salmon fishing in the rivers of the Bella Coola Valley. In recognition of its reputation for world class rainbow trout fishing, Nimpo Lake was chosen to hos t the Commonwealth Fly-Fishing Championships in 1993 on the Dean River which included John Denver as the celebrity angler. 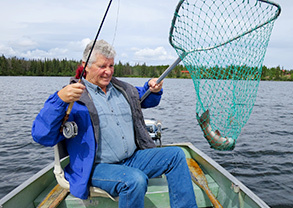 There are numerous lakes and streams to fish in the Anahim Lake and Nimpo Lakearea; so numerous that you'll never have to fish the same waterway twice! The waters in this area are generally quite cold, so that the fish are fat and firm should you decide to introduce some to the frying pan. The native Rainbow Trout are well known for their dark pink flesh and the meat is often mistaken for Salmon in appearance once smoked or canned. Some of the lakes are only accessible by floatplane, which often leaves the angler with the entire lake to himself. 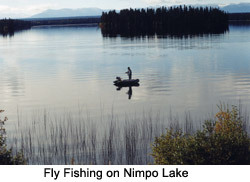 Tweedsmuir Air based at Nimpo Lake will fly the avid fly fisherman or boater to any lake they can land a floatplane on. Many of the local resorts and lodges have boats and motors located on the fly-in lakes, and in many cases, outpost cabins as well. Whether you are an avid fly fisherman or prefer to use lures, there is lots of opportunity for either to catch some very large, very hard fighting fish! Simply check with your host for the best flies or gear for the season. 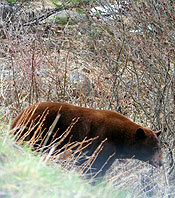 Tweedsmuir Park offers exceptional angling for Salmon and Steelhead on the Atnarko and Bella Coola Rivers. The rivers can be waded or fished from shore and gravel bars, or you can float them using rafts or river boats. Depending on the time of year, the run may be Coho, Chinook, Chum or Pink Salmon. 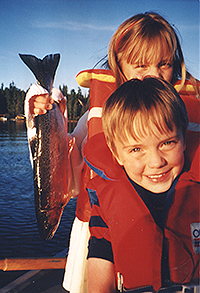 A special salmon fishing license is required so check the fishing regulations for the requirements. 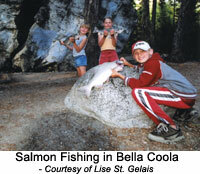 Of course if you would like to go Salt Water Fishing, there are guides and charters available in Bella Coola. Steelhead and Salmon of every kind, Rainbow Trout, Kokanee, Dolly Varden and Cuttthroat are on the menu here! For those of you that are dyed-in-the-wool fly fishermen, and want a river to yourself, the Dean River is a world- renowned fly-fishing river. 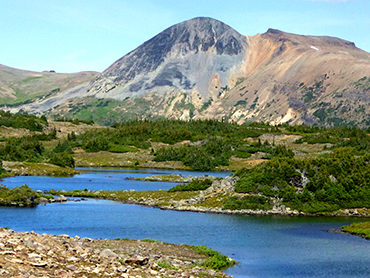 The Dean empties out of Nimpo Lake, and runs through Anahim Lake on its way to the Pacific Ocean. Once it leaves Anahim, it becomes a fairly wild river picking up tributaries along the way. Some of the country surrounding the Upper Deancan be pretty rugged, and there are quite a few rapids and falls on the river, making it nearly impossible to traverse it with any kind of boat or raft. However, it is accessible in places and where it widens out, there are loads of calm pools and riffles to drop a fly for its famous fighting Rainbow Trout. 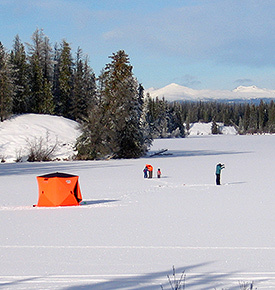 The Anahim Lake and Nimpo Lake areas are also popular winter destinations and ice fishing and can result in some mighty tasty trout in the pan if you would like to combine that with some cross country skiing or snowmobiling on your winter vacation. Join us here in the West Chilcotin where you can bob gently on a lake in a boat or float tube enjoying the incredibly beautiful mountain vistas listening to the loons. Fly to a remote alpine lake where wild flowers color the hillsides and wildlife abounds, or wade a glassy river teeming with fish just waiting for your fly to land. The arrival of Pan Phillips and Rich Hobson in the Chilcotin.